You don’t have to settle for a smile that you hate. A beautiful, radiant smile is achievable! At Chicago Veneers, we are dedicated to transforming your crooked, misaligned, or discolored teeth into a smile you’ll be proud of. If you’re considering getting veneers, your dentist may recommend direct composite veneers, a cost-effective alternative to traditional veneers. 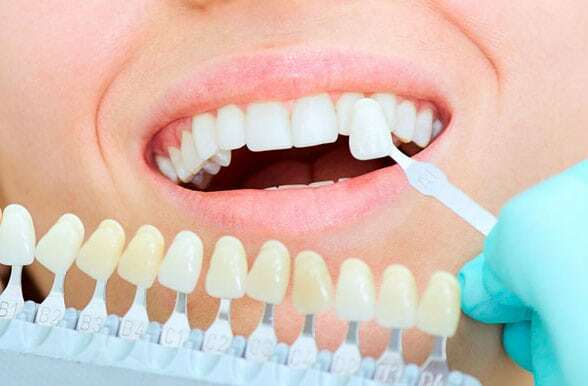 Direct composite veneers are made from a filling material that is bonded to your tooth, they do not require as much tooth preparation, and they can be easily fixed. Your dentist will help you determine whether or not direct composite veneers are the best option for you. How Are Direct Composite Veneers Placed? When you’ve decided that direct composite veneers are the right choice for you, your dentist at Chicago Veneers will prepare your teeth and take an impression. During your initial appointment, your dentist will also whiten your teeth. The impression will be sent to a lab where your veneers will be custom-made for you. In the meantime, your dentist will fit you with temporary veneers. Once your veneers come in, your dentist will affix the veneers permanently to your teeth and polish your veneers. As with our other veneers, you will be given a nightguard to ensure the long-lasting beauty of your new smile! If you want to know more about how direct composite veneers can give you the smile you’ll want to show off, call our office today at (312) 435-0411 or request online your appointment.